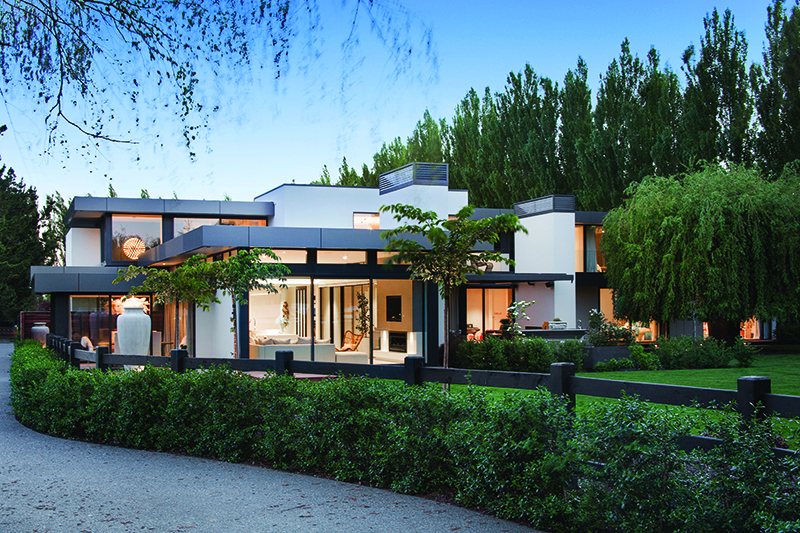 In delivering a private rural sanctuary for a Christchurch family, Metzger Builders won their clients’ unconditional approval and a few awards as well. When Rachael Cone and Rob van Nobelen prepared a design brief for their architect Darren O’Neil, they specifically said they did not want a ‘show home’. They wanted a lifestyle home that would accommodate and suit their growing family and real estate business and complement the rural lifestyle block they had purchased. 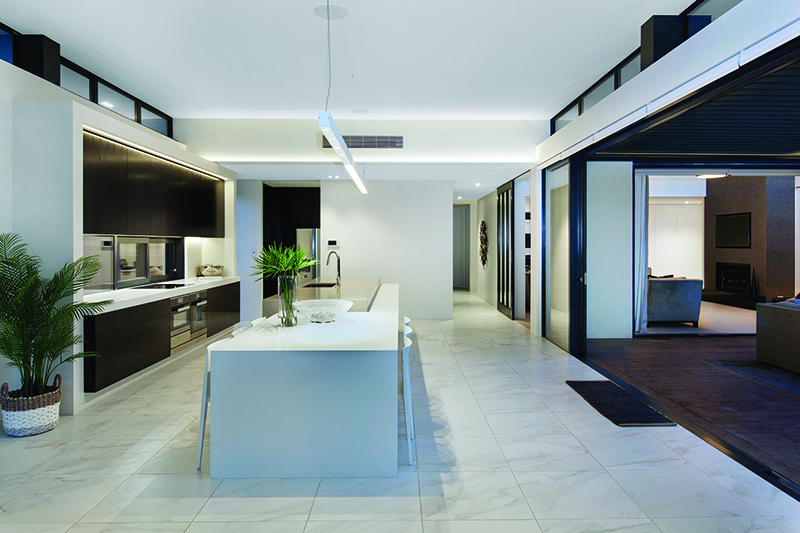 The home has certainly achieved a show home status, winning two awards in the recent Canterbury Master Builders House of the Year. Builder Mark Metzger, owner and director of multi-award winning building company MBL, is justifiably proud of the accolades. He attributes the success to the entire team involved in the project. “It’s very gratifying to receive an award. Creating a home of this scale and calibre is a complicated process but it works really well when you surround yourself with the right team,” Mark says. It was almost four years in the making from when Rob and Rachael sat down with Mark to discuss concepts for a new, bespoke home. The couple had visited and admired a show home built by MBL and decided they would engage Mark and his team to design and build a house for them and their three young children. By the time the plans were complete, the family had increased in size and now Rob and Rachael share the 700 square metre home with their four children aged 12, 7, 5 and 22 months. Mark, a builder with 30 years’ experience in the building industry, including more than 26 years in Christchurch, has established lasting relationships with many leading designers, suppliers and tradespeople. He engaged many of his key contacts in this project, including Melissa Merrin from Lume Design. The contemporary, modern plastered home features an overheight central living area; full height, oversized interior dividing doors to increase the volume of space; a dedicated soundproofed movie room; fully automated lighting, heating and audio/visual systems; generous storage areas; and a strong connection to the outdoors with all living rooms and bedrooms opening to the private garden or the upper deck. The home is in an area they love – Rob grew up in the house opposite – and the 9,000 square metre site benefits from the many large established trees that surrounded the original home. Living rooms open to a north facing courtyard where a large louvre opening roof system from Louvretec provides year round shelter from the elements. The matt charcoal double bay roofing units are fitted into a steel frame. On the roof three flues are finished with slatted chimney cowls that replicate the strong vertical lines of the louvres and the home’s structure. Lume Design was engaged to advise on many aspects of the interior, including the kitchen, scullery, bathrooms, and furniture design and selection. The kitchen is the heart of the home. Bathed in natural light, the space is generous, family-friendly and functional. An extended bench with a waterfall end works as a dining area, homework area and general everyday work space. Beyond the kitchen there is an informal lounge area and a sumptuous dining room enclosed by glass. A mix of materials and finishes include dark stained quarter cut American white oak, lacquered doors painted in Resene Half Merino, a Caesarstone splashback and two different engineered stones in the kitchen and scullery. The luxury of space encouraged creativity and innovation with finishes and lighting. Recessed, inbuilt LED profile lighting provides good surface light on the bench area and cove lighting above provides softer ambient light. All six bedrooms have ensuite bathrooms and while the master ensuite took out the recent award, every bathroom is a symphony of fine design and quality fittings. Colours, mixers, tapware, tiles and sink tops were all specifically chosen for their users. In the magnificent master ensuite, dark colours and assorted textures, shapes and finishes combine to create a moody and dramatic interior. The girls’ bathroom is more feminine and understated with cream and white ceramic and porcelain tiles. In the boys’ area three dimension black hexagon mosaic tiles and black pearl honed porcelain tiles introduce a more masculine decor style. PlaceMakers have worked alongside MBL for many years and supplied frames, trusses, loose timber and the Kwila Decking. 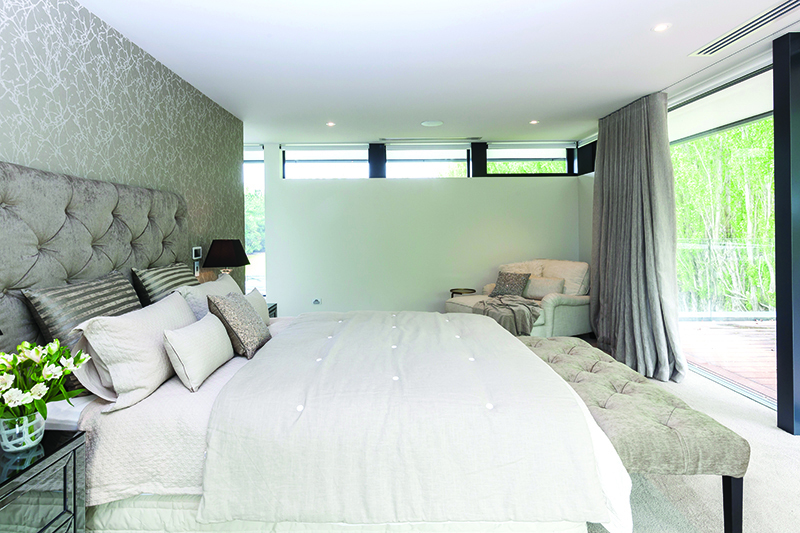 Nextdore collaborated with Lume Design, the owners and Ali Metzger to provide expertise, suggestions and quality selections for the flooring finishes, including the luxurious Cavalier Bremworth solution dyed nylon Inscape carpet, in colour Dove, in the living rooms and bedrooms. Spanish tiles contribute to the ‘wow’ factor throughout the home. First impressions really do count in this home and the entry lobby includes a water feature, designed and created by Geoff McConnell of Contemporary Water Sculptures, under a floating granite staircase that leads to the upper level. The staircase is lined in glass and each step is engineered to hang from the wall. Inside the front door a cloakroom recess is ideal for storing jackets and shoes. Rachael wanted a powder room with a point of difference; bold patterned wallpaper and a chrome tap resembling a drip of water hanging from the ceiling make quite a statement. 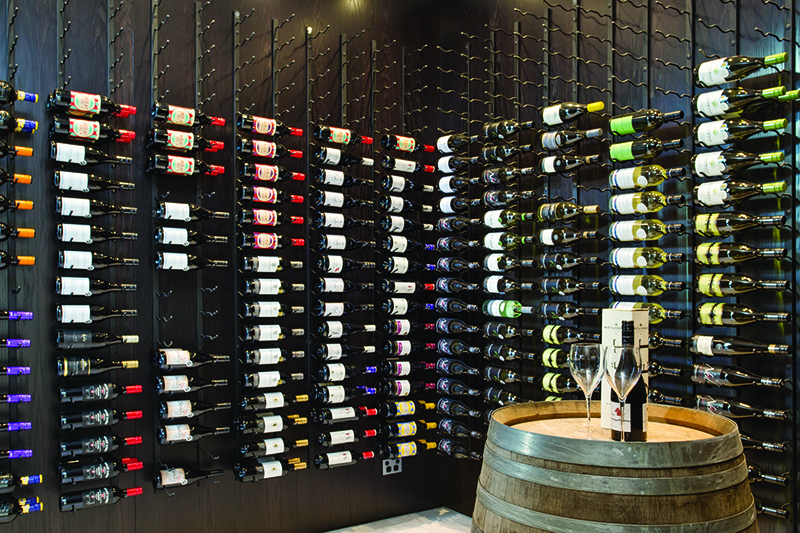 At the end of the hall a glass door provides a view to the wine cellar where the walls are lined from floor to ceiling with wrought iron double bottleracks. An aged oak barrel leaner was a surprise gift from Mark to the owners. “At MBL we value our clients above all else and love to exceed their expectations, not only with the standard of workmanship but with every detail of delivery.” Continuity in the project team is another MBL guarantee and contracts manager Rick Leftly and site foreman Brad Jarvis ensured there was a seamless interface between the owners and the entire delivery team on a daily basis throughout the project. On the upper level, in addition to the homeowners’ suite, there is an office, mezzanine lounge area, library and two bedrooms. The ‘couples retreat’ area includes a sumptuous bedroom, fully-equipped kitchen, large walk-in robe and the award-winning ensuite bathroom. The bedroom opens to a wrap-around deck engineered to accommodate a spa pool. Glass sliders can be peeled back to provide unobstructed access to the outside. The aluminium joinery was supplied by Rylock Canterbury from the Pacific Rylock suite. The argon gas-filled doubleglazing is thermally broken, utilises a Warm Edge Spacer and features Planitherm XN Low-E glass. The matt charcoal frames are rebated to create a flush threshold, minimising the transition from inside to outside. Eurosliders, Eurostackers and a glass-framed entry pivot door are all in keeping with the high quality fixtures and finish throughout the entire home. Rachael and Rob have been in the home for almost two years and concede there is nothing they would change. “It’s perfect for us and our children,” Rachael says. For Mark, achieving that level of customer satisfaction is the aim of every MBL project. Winning awards is a bonus. The home is one of 100 to reach Gold Reserve status at regional level of the Registered Master Builders House of the Year Awards taking them to the national competition to be held later this year.